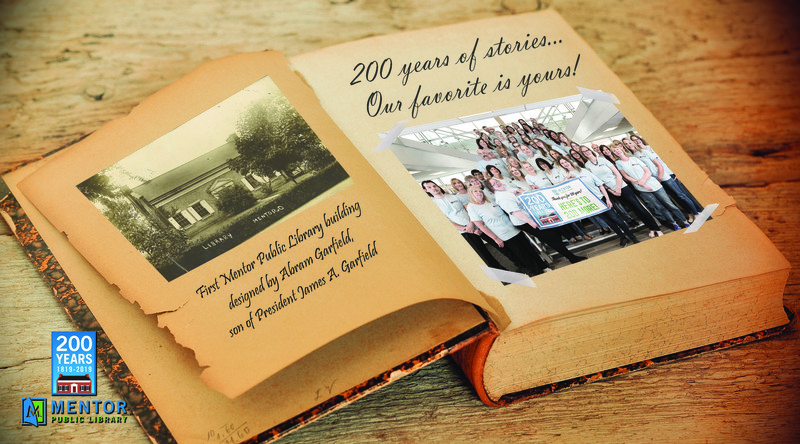 Help us celebrate our 200th anniversary all year long! Here are some ways you can join the party! We’ve compiled a list of 200 books for our big anniversary – everything from Walt Whitman to Margaret Atwood, Judy Blume to Goosebumps. The more books you read from our list, the bigger prizes you’ll win. 10 books, you receive a MPL microfiber cloth. 25 books, you earn two free books from the Friends of the Mentor Public Library. 75 book, you get a MPL Pint Glass. an astonishing 100 books, you win a gorgeous MPL blanket​. But reading is its own reward, and you don’t need to read a book a day to make it worth your while. Peruse our list, pick a few favorites, and start reading! We’re hosting programs that celebrate the history of our community all year long. Kids can join us for tea with First Lady Lucretia Garfield at 1 p.m. on Saturday, Feb. 9, at our Main Branch. Meanwhile, adult can learn about Mentor from the man who literally wrote the book on it. Tom Matowitz, local historian and author of Mentor, will share untold stories from the city’s history at 6:30 p.m. on Thursday, June 20, at our Main Branch. Visit our online event calendar for more upcoming programs. Each month, we’ll collect items for the nonprofit at all of our branches. And the donations will help support those who need it the most. You have two ways to shed some of your library fines this year. This is not an amnesty for fines accrued on already returned items. It’s for items that are being returned that day, which are overdue or lost. The items must be in good enough condition that they can return to the library’s collection. Finally, we’re waiving the fines on the returning items. However, you’ll still have to pay the collections fee if your account has been sent to a collections agency. Additionally, everyone will get a chance to read away their fines during Saturdays in September. For every 30 minutes you read at the library, we’ll waive $1 from your fines. You can save up to $10 – just for reading! We know something about stories. We have tens of thousands lining the shelves of our branches. But now the library wants to know your story. People’s favorite memories involving Mentor Public Library. If you have a photo or memory you wish to share, please contact us. 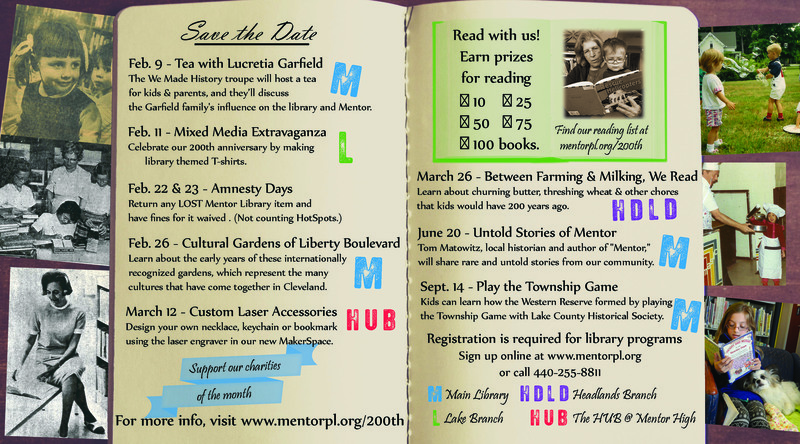 You can either email Jason.lea@mentorpl.org or call us at (440) 255-8811 ext. 213. Thank you to the Lake County History Center for their article on our library’s first 200 years. We’re looking forward to many more! To read the article, click here. For more information on the Lake County History Center, see their website.